It’s that time of year again! The monitoring and headstarting team have arrived at the breeding grounds in Meinypil’gyno, Russia to await the return of the spoon-billed sandpipers, and at WWT Slimbridge, we’ve moved birds to breeding aviaries and the singing and nest scraping has begun. In Russia this year, we again hope to headstart 30 birds and hope to see the return of headstarted birds from previous years. The number of pairs and nests found will also give us an indication of how the population has fared during the winter. Last year the unusually warm and dry conditions meant birds were spread out in the breeding area differently to previous years and a number of ‘regulars’ at the site weren’t seen, including the prolific monument pair. It’ll be interesting to find out if any ‘missing’ birds last year are re-sighted this year. And we’ll be hoping to hear news of some of the best known headstarted birds including White MA and White AA – both of which were headstarted in 2013 and returned to Meinypil’gyno to breed in 2015 and 2016. Headstarting is a collaborative effort between WWT, BirdsRussia and the RSPB, and occurs as part of the International Arctic Expedition mounted each year by BirdsRussia under the leadership of Dr. Evgeny Syroechkovskiy. A sight we’re hoping to see again: White MA (left) and White AA (right) at Meinypil’gyno in 2016. Photos by Egor Loktionov. At WWT HQ in Slimbridge, the aviculture team are also gearing up for the breeding season. As regular readers will know, last year was a year of extreme highs and extreme lows. We saw the first eggs laid, a fantastic step forward for the breeding efforts, but unfortunately, both of the chicks that hatched from these eggs were lost at a few days old. Each year the birds have taken a step closer to successful breeding so we are all hoping 2017 will see the first fledglings. Keep everything crossed! More updates as things develop. Good luck to everyone helping these lovely birds. 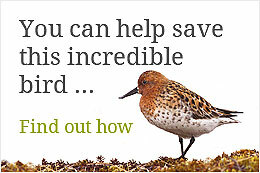 I am so proud to be a WWT member – such good work you do! How exciting that the Slimbridge birds are singing and scraping well. Hopefully the lovely females are in full breeding plumage and all will go a lot better than last year. Well done Rowland on getting back to Meino. in plenty of time and good luck to all the guys in the tundra. All my fingers and toes are crossed for you all. Good luck! Hope lots of success this year. Look forward to the updates. Many thanks. Best wishes. My sincere wishes for success to your team – from Malaysia. Great work. Keep it up!! We are all on tenterhooks this year, everything that can be, and few things that really shouldn’t be, have been crossed. Good luck to the whole team and of course to the birds themselves.